Asparagus is a perennial vegetable with a delicious taste and delicate texture, but shop-bought spears can be expensive, and stems are often disappointingly tough and tasteless. If you’re planning to grow your own, it’s worth putting in time preparing the ground to give them a flying start in life. A sunny or partially shaded spot is ideal, with a light, free-draining but moisture retentive soil. Prepare beds in advance by removing all weeds. Dig the bed at least 60cm deep and place a layer of bones or bone dust on the bottom. Mix top soil with as much rich compost as possible and layer with sand. 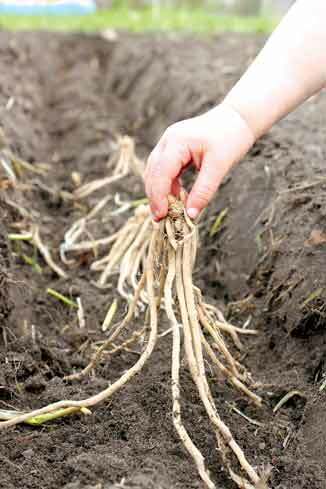 It’s a good idea to make a long, narrow bed for the asparagus crowns — that way both sides can be easily reached for picking. Raised beds can help improve drainage on heavy soils and are warmer, encouraging early cropping each spring, and also make it easier to mound soil over growing shoots. Select healthy two year old crowns such as the vigorous variety ‘Purple Gourmet’, and soak crowns in warm water for an hour before planting. Around thirty crowns would be needed to feed four or five people. Plant crowns during early spring in rows 40cm apart, spreading roots out, and water in well — if using raised beds plant in blocks. Cover with compost or well-rotted manure. 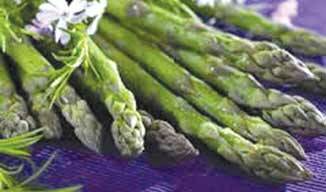 Companion plants you could cultivate with asparagus include basil, parsley and tomatoes. 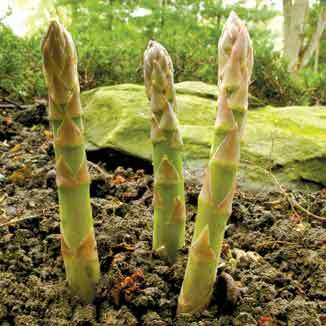 Manure, mulch and water are the secrets to growing fine asparagus. Feed the plants with blood and bone every two or three weeks and sprinkle the bed surface with salt and potash from time to time. Weed regularly to reduce competition and to keep beds clear. The first spears are the most delicious, and should be cut with a sharp knife to avoid damage to the parent plant. Always leave a few spears to mature and make energy to supply next season’s crop. Avoid cutting any spears the first summer and only a few new spears the next. This allows the plant to establish, and ensures steady cropping from the third year onwards. After seven or eight years begin a new bed — dig up the first only when the new bed is in production. As well as being a delicious- tasting vegetable, asparagus contains an excellent supply of a protein known as histone — a substance that’s been called ‘a cell growth normaliser’. The US National Cancer Institute has reported that asparagus is the highest tested food containing glutathione, considered one of the body’s most potent anti-carcinogens and antioxidants. So, not only does it taste good, asparagus is also good for you!